Tokyo, Oct 29 (IANS) In what could be seen as remarks hinting at China, India and Japan on Monday called for a “free and open” Indo-Pacific and agreed to hold a 2+2 dialogue of foreign and defence ministers of the two countries. This assumes significance given China’s growing influence in the Indo-Pacific region and its belligerence in the South China Sea. “Based on their shared vision, the two Prime Ministers reiterated their unwavering commitment to working together towards a free and open Indo-Pacific,” the vision statement said. The two sides also exchanged notes for seven yen loan agreements for key infrastructure projects in India. India and Japan committed to further consultations with host governments to foster tangible cooperation focusing on development of connectivity and other infrastructure in the Indo-Pacific. “This synergy is embodied in collaborative projects between India and Japan in the Indo-Pacific region, including in Sri Lanka, Myanmar and Bangladesh as well as in Africa,” the Vision Statement said. It also stated that both leaders reaffirmed their desire to further deepen bilateral security and defence cooperation and institute Foreign and Defence Ministerial 2+2 Dialogue in addition to existing mechanisms, including the Annual Defence Ministerial Dialogue, Defence Policy Dialogue, the National Security Advisers’ Dialogue, Staff-level Dialogue of each service. “Without the cooperation between India and Japan, the 21st century cannot be an Asian century,” Modi said in a joint address to the media with Abe at the summit meeting. “Abe-san and I have agreed to start a 2+2 Dialogue between our foreign and defence ministers,” he said. Describing Japan as the confluence of the best aspects of eastern and western civilisations, Modi said that the country has taught that the path to the development of mankind is not a conflict between the ancient and the new, but its co-existence and creation. 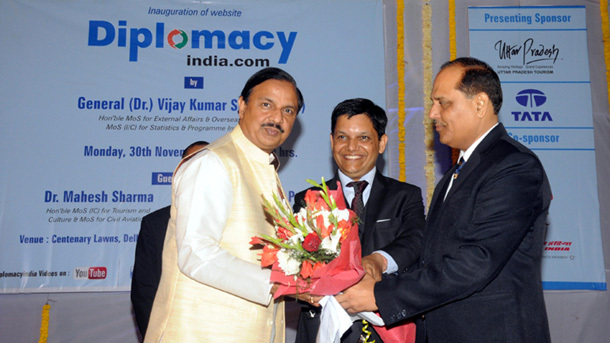 “The relations between India and Japan are as deep and wide as the Indian and Pacific Oceans,” he said. 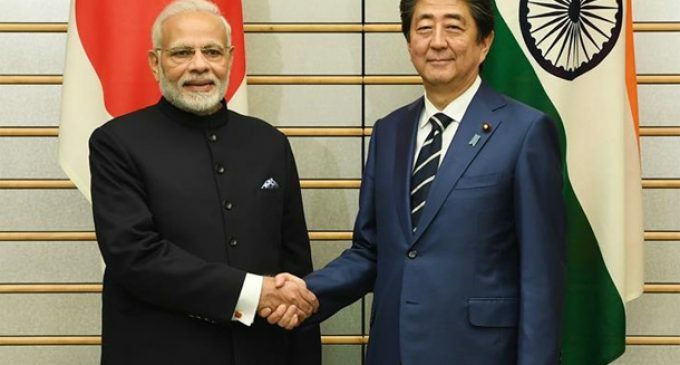 Modi said that he and Abe agreed that from digital partnership to cyberspace, health to defence and from oceans to space, both sides will strengthen their partnership. He also said that the $2.5 billion new investments that Japanese investors have committed earlier in the day will help create some 30,000 jobs. On his part, Abe said that cooperation between the naval forces of the two countries will increase. He also said that to boost regional connectivity, Japan and India will work together in third countries like Bangladesh. According to the Vision Statement, the two leaders welcomed the joint exercise between each of the three defence services of the two countries and the commencement of negotiations on the Acquisition and Cross-Servicing Agreement (ACSA), which will enhance the strategic depth of bilateral security and defence cooperation. The two leaders also welcomed recent developments in the Korean Peninsula, including the US-North Korea summit in Singapore in June and three inter-Korean summits this year as a step towards the comprehensive resolution of the outstanding issues regarding North Korea. “They underscored the importance of realising North Korea’s complete, verifiable, and irreversible dismantlement of all weapons of mass destruction and ballistic missiles of all ranges in accordance with the relevant United Nations Security Council resolutions (UNSCRs), and the importance of addressing concerns related to North Korea’s proliferation linkages,” the statement said. The two Prime Ministers condemned in the strongest terms the growing threat of terrorism and called upon Pakistan to bring to justice the perpetrators of terrorist attacks, including those of November 2008 in Mumbai and January 2016 in Pathankot. “They looked forward to strengthening cooperation against terrorist threats from groups including Al Qaeda, ISIS (Islamic State), Jaish-e-Mohammad, Lakshar-e-Tayyiba, and their affiliates,” the statement said. The seven loan agreements signed totalling 316.48 billion yen will be utilised for the Mumbai-Ahmedabad high speed rail, project for renovation and modernisation of Umiam-Umtru Stage-III hydroelectric power station in Meghalaya, the third phase of the Delhi Mass Rapid Transport System Project, road network connectivity improvement project in northeastern India, project for the construction of Turga pumped storage in West Bengal, project for the construction of Chennai Peripheral Ring Road and project for sustainable catchment forest management in Tripura. In all, 32 documents were exchanged in front of the two Prime Ministers following the meeting, including on cooperation between the naval forces of the two countries, healthcare, digital and new technologies, and food processing.